Have you heard the news? 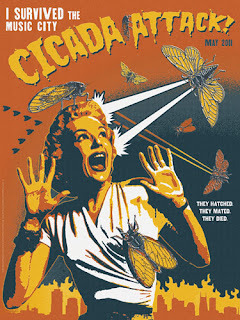 It's on the horizon...yes, the 17 year cicadas are coming! 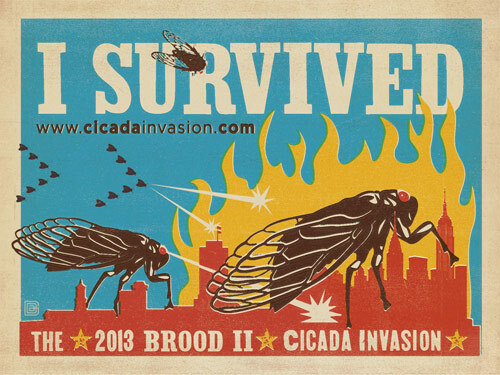 Brood II, in fact, will be upon the East Coast at any time. But it will be ok - you'll be ok - everyone will be ok. I know because I was there once...in another time, another place. The year was 1987. I was a seventh grader at Washington Irving Middle School in Springfield, Virginia. The summer was upon us - hot and humid, and quiet but for the trees whispering in the wind. But this quiet would not last, oh no, because the Brood X 17 year cicadas were to emerge that summer...flooding the air with their chirping drone, loud enough to keep me awake at night when I needed the windows open to cool my bedroom. It must've been June when the cicadas arrived...when their song first announced their presence. At first I was scared. At that age, I did not particularly like insects, especially large ones, and especially ones that could fly. But there was no avoiding them. As I walked to the bus stop in the morning, they were everywhere - covering the trees, on the ground...there were shed exoskeletons littering the grass. In some areas, you could not avoid walking on them. But as I was forced to coexist with these creatures, I discovered that they were fascinating - they had these beady red eyes, black bodies and clear wings - and they were actually kind of cute. They didn't move fast, which I also liked. It was easy to pick them up - I can still remember how their jagged legs clung to my hand. And before I knew it, they were gone. 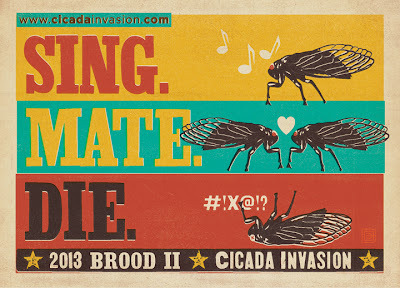 Their bodies remained, but their mission had been accomplished: they mated, and died. They would not return for another 17 years, and the cycle continued. 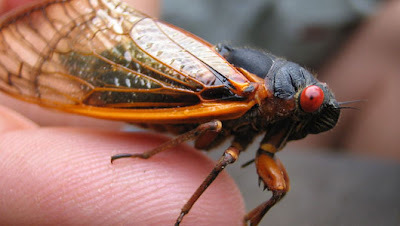 Cicadas are amazing insects with a unique life history strategy. Want to read more? Check out the article I wrote that describes how these creatures live and die. And don't be afraid - these incredible animals are a part of our ecosystem and are a sign of healthy forests. Embrace the beautiful cicada, in all its red-eyed chirping glory! The senior class at my HS that year "embraced" the swarm by "sharing" it with the rest of the school in a tremendous senior prank-! It was overwhelmingly amazing....And creative...And BIG trouble.... But unforgettable!